"Our friends are dying. Fight! Fight!" The Orchard has unveiled the US trailer for a French film titled 120 BPM, also known as BPM (Beats Per Minute) in America, which premiered at the Cannes Film Festival earlier this year. I am a big fan of this film, it's an emotional, powerful, inspiring recreation of the true story of a group of AIDS activists in the 90s fighting for medicine & support against indifference & intolerance. The film won the Grand Prix Jury Prize at Cannes, as well as the FIPRESCI Prize. "A film about love. A film about life. Life stronger than death. A film as a glimpse of hope." 120 BPM's ensemble cast includes Nahuel Pérez Biscayart, Arnaud Valois, Adèle Haenel, Antoine Reinartz, Félix Maritaud, Médhi Touré, Aloïse Sauvage, Simon Bourgade, and Catherine Vinatier. This film is definitely worth your time. 120 BPM. The average heart rate. The protagonists of 120 battements par minute are passionate about fighting the indifference that exists towards AIDS. Early 1990s. With AIDS having already claimed countless lives for nearly ten years, Act up-Paris activists multiply actions to fight general indifference. Nathan, a newcomer to the group, has his world shaken up by Sean, a radical militant, who throws his last bits of strength into the struggle. 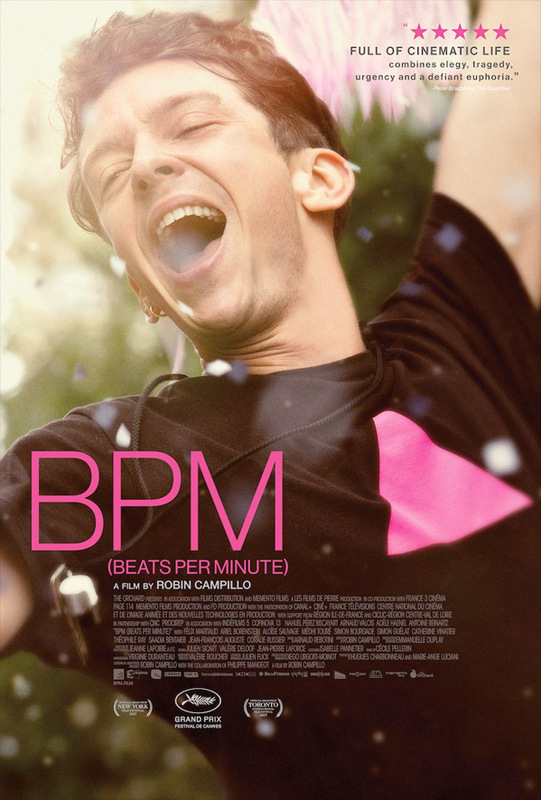 120 BPM, also known as BPM (Beats Per Minute) in America, is directed by French-Moroccan filmmaker Robin Campillo, a screenwriter/editor and director of the films They Came Back and Eastern Boys previously. The screenplay is written by Robin Campillo and Philippe Mangeot. This first premiered at the Cannes Film Festival earlier this year. The Orchard opens Campillo's 120 BPM in select theaters starting October 20th this fall. Highly recommended film. Who's interested?